Do you have an awesome collection you would like to display at the Bradford Public Library? We have a library display case available to those who wish to share their passion with the public. Some display ideas include: nativity scenes, local crafter contributions, train memorabilia, collectible statuettes and more! Library Director, Cherie Roeth traveled to the National Parks in the South Western United States last summer. 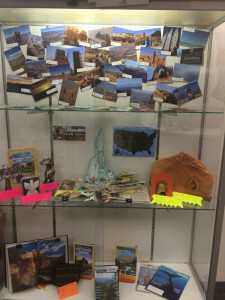 She has several beautiful photos and unique souvenirs from her trip in our display case now. Be sure to take a look when you come in! Please fill out the PDF below and email it to the library at bradfordpublic@gmail.com or bring in your request form and drop it off at the front desk. We look forward to seeing your display!